Herkybirds nest: Ein Dakka Dakka Dakka! 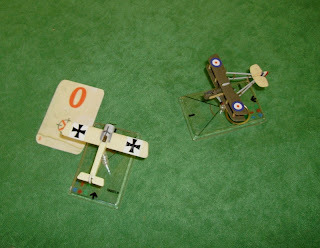 As the title suggests, this week saw the first outing for my new DH-2s and Fokker E-3s, using my new 'T' deck solo rules for the Eindeckers. I almost always repaint the WofG models, but the Eindeckers will have to wait till I have done more research. The DH2s are all done as the same flight in 24 squadron RFC in November 1916. (1) The upright rear fuselage stanchions are wood, not metal. (2) The aircraft have a small roundel on the side of the nacelle..I have ordered some to stick on later! Ian - as usual - deployed far to one side, hoping to outflank the Boche! The rest of our DH-2s deployed in a loose line. We rapidly closed, shooting as we had targets. Ian bumbled along, biding his time! We manoeuvred our DHs to try to turn on the Germans. Ian - finally- made his move on the rightmost fokker - and jammed his guns! as the Eindeckers turned to attack, A DH got a telling shot. Both sides turned to 'Get a bead' on the opposition. My DH took damage, but the Eindeckers escaped unhurt! Caught between Ian and my DHs, a Fokker crashed and burned. Phil's DH came under attack. ..but he Immelmanned to safety. We closed again on the 'Red' marked eindecker. In the melee, my DH caught fire, but my assailant took more damage from his flank. One of the Eindeckers turned to re-enter the fray. In the main battle, the greater number of allied machines was telling. Lawrence and Phil's DHs both jammed at a critical point! Unable to respond, they took little or no damage in return. My DH (left in this pic) was burning and taking heavy damage! ..until, assailed by another German, my machine broke up and crashed. The remaining DH's were continuing to be plagued by jams. ..but the eindeckers were unable to take advantage. The next pass was brutal! All the remaining aircraft were moderate or heavily damaged now. ..any damage could be critical. Both sides gamely continued to fly aggressively. A DH Immelmanned and helped destroy a heavily damaged Fokker. The Germans broke off after this, not knowing how close they were to winning! At least the 'T' deck solo rules game us a good game!..they should be available on the club website soon, or can be sent to you direct. Just E-Mail me on the address on the top of the page! Nice read and good pictures sir! Samurai - into the mincer!